When I worked in an office, my colleagues kept me up to speed on tech, jargon, and TV shows. Since I became a freelancer, I’ve had to rely on magazines in doctors’ offices. 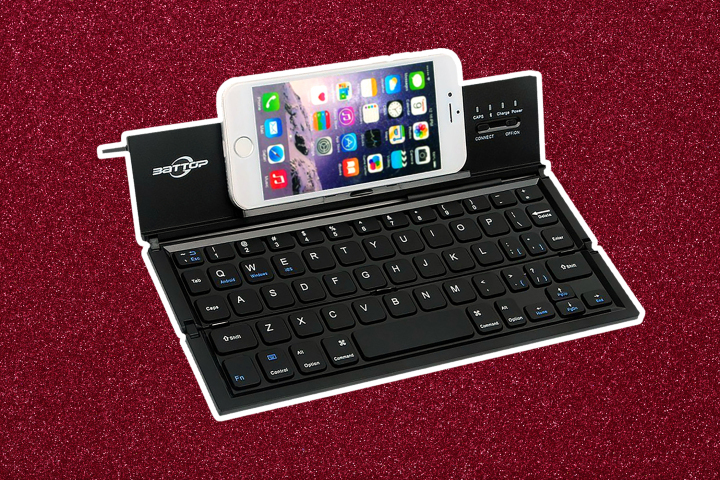 Thus I’m a year late discovering the Battop Folding Keyboard. This inspired pocket-size device folds up as small as your phone, and when opened, not only lets you type in semi-comfort with your phone as a screen, but provides a stand for it. I saw it in a “gifts for under $30” spread and fell in love instantly. There are plenty of others on the market now, naturally, but none that I’ve read about is quite this ingenious. What that says about Amazon’s definition of “customer-centric” — and Amazon’s definitions loom very large for those of us writing and publishing books — I find troubling. I’m hoping to make more headway in Round 2 — at the very least, badger them into showing the real cover for that out-of-print secondhand textbook.